Extract of black walnut forms part of a three-herb treatment for internal parasites. Black walnut leaves, hulls and nuts were used medicinally as long ago as the Roman Empire. Culpeper's Complete Herbal lists walnut as a treatment for much more than parasitic worms. 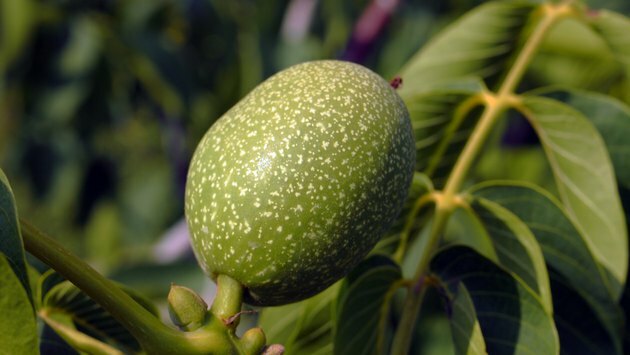 Walnut also treats "green wounds," and the bites of mad dogs, according to Culpeper. While there may be support for some medicinal claims, seek a physician's advice before taking this herb. Black walnut's ability to suppress the growth of other plants may have inspired ancient beliefs in its curative properties. Juglone and hydrojuglone -- found in the tree's sap and in all tissues of the tree -- poison the root zone of the tree and stunt the growth of many woodland competitors. This allelopathic effect makes black walnut a problem for gardeners even though not all plants succumb. Currently Dr. Hulda Clark promotes juglone-rich black walnut tincture as part of her 18-Day Parasite Cleanse. Taken on a strict schedule along with extracts of wormwood and cloves, this herbal treatment attacks over 100 types of internal parasites, according to Dr. Clark. Other herbalists promote black walnut as a cancer treatment, based on a belief that parasites cause tumor growth. No scientific studies support the theory that black walnut kills internal parasites. Dr. Clark's claim that this herb works effectively when taken in conjunction with wormwood and cloves has not been evaluated by the U.S. Food and Drug Administration, or FDA. Juglone may reduce the risk of cancer, but according to the American Cancer Society, laboratory studies on humans aren't complete. No scientific evidence links cancer to the presence of internal parasites. Dr. Clark's treatment begins with carefully measured amounts of cloves and wormwood taken in capsule form, along with a dose of green black walnut hull tincture. The black walnut treatment starts with one drop per day, increasing by one drop per day for five days. On the sixth day, dosage increases to 2 tsp. Patients continue taking 2 tsp. of black walnut tincture weekly. Escalating doses of cloves and wormwood make up the rest of the treatment. Although the Clark treatment claims to kill all parasites in 18 days, she recommends continuing the weekly doses of herbs indefinitely to prevent reinfection. Black walnut leaves contain beneficial antioxidants. Old herbal uses for black walnut included the treatment of skin conditions with black walnut teas and poultices made from leaves and hulls. In modern Germany, black walnut leaves gained official approval as a topical treatment for perspiration problems. The approved poultice also treats skin inflammations. Black walnut contributes far more health benefits as food. The high-calorie nutmeats contain high amounts of dietary fiber, protein, and beneficial fatty acids important to cardiovascular health. Because juglone shows possible mutagenic properties, pregnant women should not take black walnut herb. Lactating women should also avoid black walnut because in high doses the herb causes the bowels to empty. The active ingredient in black walnut tincture passes to infants through the breast milk, and young children react strongly to smaller doses. Anyone with tree nut allergies should avoid black walnut products. Peanuts cause more cases of serious allergic reactions, but tree nuts like black walnuts hold second place as allergenic threats.